Let's get this out of the way. If any young actress is stupid enough to walk up to a legendary actress and ask for her autograph on behalf of her grandmother for goodness sakes, that little chickie deserves to be blackballed right out of the industry. That was an affront against Joan Crawford on FEUD: Bette and Joan Season 1 Episode 2 that allowed for just a hint of friendship to blossom between Joan and Bette Davis. If the men in their lives didn't have problems with their self-confidence, history could have ruled for Bette and Joan. They were very close to making things right. Unfortunately, it was too easy to take the already diminished egos of the leading ladies and curtail them even further. As Joan Blondell and Olivia de Havilland were chatting about in their 'documentary' scenes, women were always pitted against each other, because the business didn't like when they were friends. To be friends would mean they could join up and wield power over the men they worked with or for, and that's exactly what Bob Aldrich was experiencing when it came to the blonde bimbo with the pea-brain who asked for the autograph for her Joan-loving grandmother. He shouldn't have even questioned why Joan or Bette wanted the girl off the set. I wouldn't have trusted a gal with that limited capacity to think to be a good actress. Believe in your stars, Bob. And Jack. Good God, Jack Warner. I'm reading a combined biography on Bette and Joan, and now I'm going to have to pick up one on Jack Warner. His business acumen is topsy-turvy. It's a great idea to open wide in theaters and that he's taking cues from Psycho. But they're burning up the screen, Jack. You should have paired them years ago. Permalink: But they're burning up the screen, Jack. You should have paired them years ago. But did he actually have so little belief in his Oscar-winning talent that he believed they'd never be able to pull off the movie without being angry with each other? They could have just as easily been peeved at Jack and used that anger to push through the emotional range Bob was seeking for the roles. While watching Whatever Happened to Baby Jane, I didn't feel genuine rancor between the actresses, but for their characters. Could he have been putting his own spin on the situation? It's pointless to hope somebody is going to step in and do right by the ladies because their feud is infamous. From what I know, they never made up before their deaths. I wonder, though, if they saw it all play out in such ugly detail, the way the men used them, playing them off of each other and the planted quotes with Hedda, etc., if they might have given friendship, or at least forgiveness, a try. Bob planting the story with Hedda was loathsome. His wife, Henrietta, told him straight out why it would be a bad idea, and he was already questioning the morality of it when Jack first raised the possibility of him doing it. Everything is such a mess, almost incestual, between the stars and Bob that when Bette heard about it and saw Bob defending Bette making the statement, you could tell she knew he was behind it, but she just kept quiet because to attempt to make even more waves would only cause her trouble on set. Hedda: Well then why would you go to my mortal enemy? Joan: Because I had to get your attention. Permalink: Because I had to get your attention. Joan believed she was friends with Hedda, so going to Louella Parsons was the next best move. What I see happening next is the gossips jumping onto the bandwagon with Bob and making much more of the feud than it is, friendship be damned. After all, just like Joan and Bette are worried about the light on their stars fizzling out, so is Hedda concerned gossip is becoming irrelevant. What better way to keep it relevant than to catch the tail end of their fizzling stars and keep them burning bright for a while? Although Joan was known to be the casting couch gal, Bette didn't like age overtaking her one bit. She'd much prefer to have men falling over her than not, and seeing her daughter taking her place with the lads was confusing for Bette. Not only are Joan and Bette fighting for the roles of their careers, but they're fighting for their womanhood. When one bats an eyelash, the other feels it a room away. They're constantly trying to one up the other whether by acting, by way of their beauty of their sheer sexual magnetism. You know what those women had that you don't, mother? Dignity. They moved aside with class after their spin on the carousel was over and that's something you've refused to do. And now look at you. You're single, lonely and doing this ridiculous role because you can't live without being in the spotlight. Well, guess what? Nobody wants you anymore. Nobody's watching you anymore. That's tough to hear from anyone, let alone your own kid. Nobody sees you quite as clearly as someone you love. FEUD is superb, but damn, is it painful to watch. 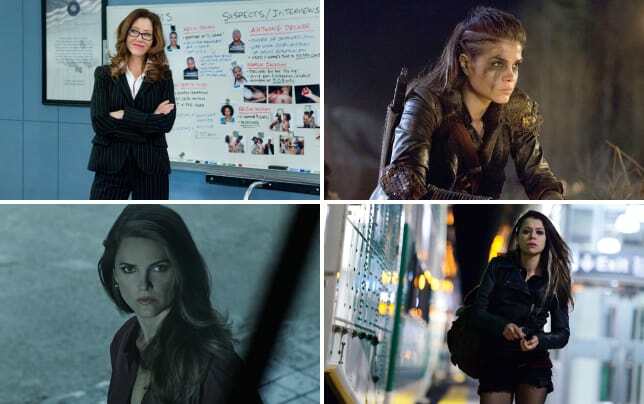 There are too many missed opportunities between these women, and the what-ifs are crazy. Joan Blondell said she thought Jane Fonda and Dyan Cannon wouldn't have acted any differently in their generation if pitted against one another. The actresses of today are another story. Finally, we seem to have come to a point in history where women don't give a hoot what men (or myriad other people) think of them. They're not pawns any longer. They can and will work together, happily sharing the spotlight to bring art to the world. Big Little Lies on HBO is an example of strong, talented women who in a different time might not have found themselves so willing to collaborate. Not to mention Jessica Lange and Susan Sarandon and all of the supporting women on FEUD. 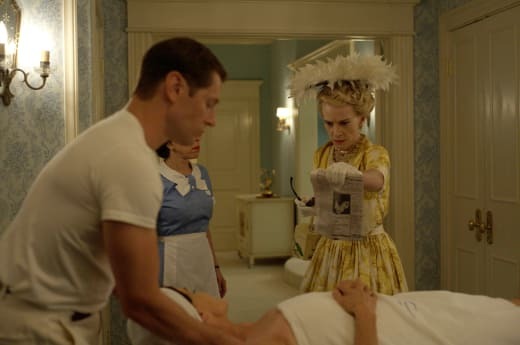 Ryan Murphy has been essential in bringing about successful efforts in this area, and it's not only appreciated but makes sense for the first installment of FEUD to show how differently men handled it in the past. That takeaway makes revisiting this incredibly tough time worth every minute. There aren't enough examples of successful alliances just yet, but we're on the right path. What did you think of "The Other Woman"? Can you believe how terribly manipulated Bette and Joan were given how we see them now? If you need to catch up, you can watch FEUD: Bette and Joan online to see some great actresses in action today. I don't need subtext, Bob, I need good text. Permalink: I don't need subtext, Bob, I need good text. You know, Bette, I think what you're doing with this part is incredibly brave. Permalink: You know, Bette, I think what you're doing with this part is incredibly brave.